For the past two decades, Antelope Island’s bighorn sheep supplied animals that re-established herds in mountain ranges all over Utah’s West Desert. Central to that success was the herd’s isolation, insulating it from the deadly pathogens carried by their domestic cousins. The startling news emerged at the end of the Utah Wildlife Board meeting Thursday, when Taylor asked the board to cancel the two coveted tags issued each year for hunters to pursue sheep on the island. The die-off illustrates the vulnerability of the West’s wild sheep and how difficult it is to manage this iconic big-game species in the presence of domestic sheep and goats. But Antelope Island is free of domesticated animals, so the source of the disease is a mystery at this point, according to DWR spokesman Mark Hadley. On Wednesday, biologists conducted a thorough survey of the island, flying at low altitude. They counted 20 ewes, four rams and two lambs, Taylor told the board, flashing gruesome pictures of decaying sheep carcasses on a screen. It marked a sorry end for a population that has supplied 250 sheep for translocations that established herds in the Deep Creek, Oak Creek and Stansbury ranges, resulting in 127 permits for an animal few hunters get to legally stalk. Only a year ago, 40 animals were captured and moved to the Oak Creek and Stansbury mountains after testing healthy, Hadley said. (AP Photo/Rick Bowmer) Officials with the Utah Division of Wildlife Resources and State Parks used a helicopter to ferry bighorn sheep to a staging area on Antelope Island, where the sheep received vaccinations and health checks on Jan. 5, 2018, before being shipped to the Stansbury and Oak Creek mountains. The island's herd has provided many sheep to repopulate West Desert mountain ranges, but a recent epidemic has wiped out the herd. The survivors are to be killed by aerial hunters this month and replaced with disease-free animals. Bighorns were once plentiful across Utah, but after the arrival of Mormon pioneers, they disappeared from disease and overhunting. After a translocation program started in 1973, they have returned to some of their native ranges, but the sheep remain a rare and sought-after big-game animal. Desert bighorns occupy southern Utah, while the state’s northern half hosts a dozen populations of Rocky Mountain bighorns and their California subspecies. Antelope Island harbors the California sheep. DWR has culled a sick herd in the recent past. 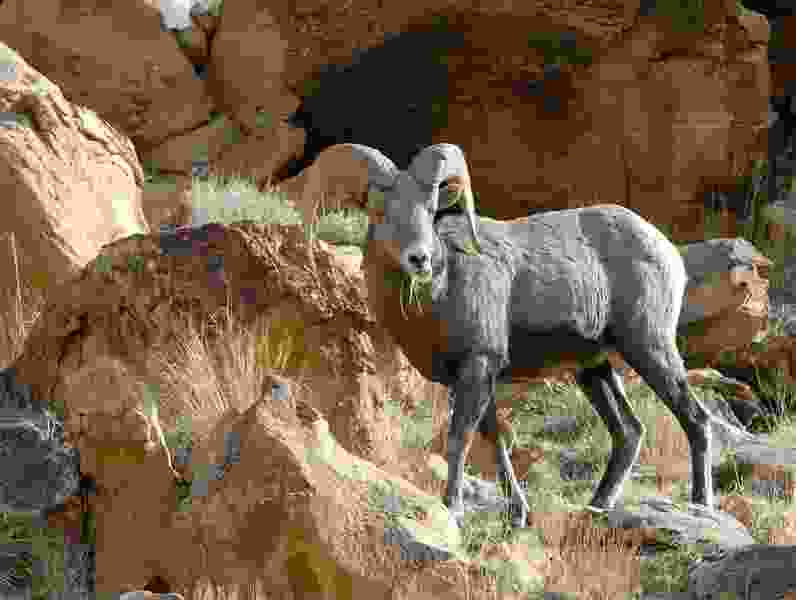 To prevent the spread of disease, wild sheep were extirpated in 2009 from Goslin Mountain, just east of Flaming Gorge, according to the agency’s bighorn-sheep management plan. In the mid-1990s, the state put desert bighorns in Zion National Park, where they had been eliminated decades earlier. That translocation has been so fruitful that the National Park Service is now moving out dozens of the Zion sheep to avoid the very catastrophe that has befallen the Antelope Island herd. The Zion herd is now so large, officials worry that some rams might wander away in search of unoccupied habitat and return after coming into contact domestic sheep, carrying a deadly microbe. Such a scenario may have occurred at Antelope Island. One of those steps is not pretty: Borne in helicopters, sharpshooters from DWR or the U.S. Department of Agriculture will target survivors from the air. That’s if there are any left alive by the time a plan is worked out. DWR wants to re-establish a nursery herd on the island as soon as possible and that requires no sheep remain, Taylor said. Officials say allowing hunters onto the island to bag the remaining sheep isn’t a viable option, even though hundreds would pay handsomely for such an opportunity. They do intend to salvage any usable meat. The Antelope Island herd was established in 1997 with 29 animals and showed no signs of trouble until November, when some of the collared rams stopped roaming. Biologists investigated the stationary telemetry signals and witnessed a troubling sight. “We found quite a few dead bighorn sheep. A number of animals that were unhealthy, emaciated, had issues walking,” Taylor told the Wildlife Board. They took mucus samples and sent them to a lab. A month later, they came back positive for a strain of pneumonia. The lab results sealed the herd’s fate. After the survivors are removed, DWR hopes to bring in new animals as early as this year. It could be years, however, before this herd could be hunted or tapped for future translocations. The Antelope Island sheep may be doomed, but their genes live on in the West Desert herds, which may soon be providing the animals that will re-establish a population on Utah’s most famous island.